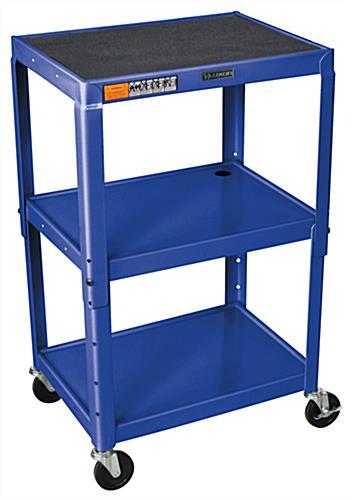 This Mobile Shelf Cart is Ideal for Schools and Offices. This Portable Trolley Features (3) Shelves and Provides Ample Storage. Each Mobile Shelf Cart Has a Blue Finish. Cable pass through hole keep cables neat and tidy at all times. (3) Shelves provide ample storage. Safety mat on top shelf and 1/4" retaining lip help prevent items from falling. Adjusts in height from 24"h-42h" in 2" increments. This portable utility cabinet is constructed of steel and features an eye-catching blue finish. Each rolling utility stand adjusts in height from 24"h to 42"h in 2" increments. This mobile shelf cart provides a great method of transportation of media devices in a school or office that needs to move or share equipment frequently. Each of the three shelves features a 1/4" retaining lip around the outside perimeter. This added safety feature, as well as an anti-slip traction mat on the top, helps to prevent items from falling off of the mobile shelf cart. The shelves measure 24"w x 18"d and provide ample storage space for media devices of almost any size! A mobile shelf cart that is constructed of durable materials supports approximately 350lbs of equipment evenly distributed. Each of these steel utility stands are sure to meet even the most demanding portability needs! 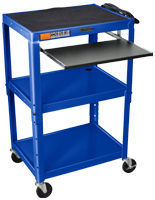 This blue mobile shelf cart is ideal for schhols and offices and will quickly become a favorite transportiation tool for all users. Customers choose these utility stands as they offer an efficient way to transport heavy AV devices and also offer numerous features that are highly beneficial. Each mobile shelf cart that is portable features (4) rolling casters that glide smoothly over most floor surfaces making transportation easy! As an added safety feature, two of the wheels have brakes, ensuring that the utility storage stand will not roll when stationary. Every mobile shelf cart features a cable management hole that keeps cords and cables neat and tidy at all times and also has a 3-outlet 15' UL and CSA listed electric assembly. This feature provides one convenient power source for up to 3 devices at one time! Each mobile shelf cart that is made in the USA is built to last for years to come! Manufacturer model# AVJ42.